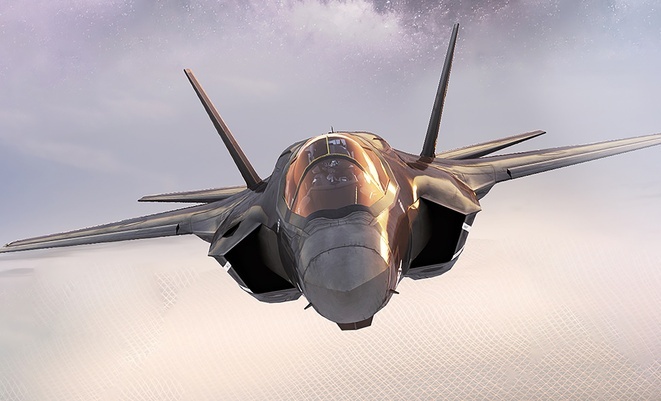 BAE Systems has reached a critical programme milestone with the successful insertion of new technology into its electronic warfare (EW) systems for the global fleet of fifth-generation F-35 Lightning II fighter aircraft. An F-35 Lightning II fighter aircraft flies through the air, with clouds in the background and a digitised grid across the landscape below. The improved EW system delivers the functionality of the previous system in a smaller footprint, reducing volume and power requirements – creating space for Block IV modernisation upgrades. The system update also resolves issues with manufacturing obsolescence that would have otherwise required costly redesign work. The advanced F-35 EW system is a proven digital electronic warfare/countermeasures suite that provides pilots with real-time battlespace situational awareness and rapid-response capabilities. The ASQ-239 system provides fully integrated radar warning, targeting support and self-protection capabilities to engage, counter, jam, or evade threats to improve survivability and mission effectiveness. The system builds on BAE Systems 60-plus years of EW experience and legacy of providing 13,500 tactical systems for more than 80 different platforms, including F-22, F-16, F-15, B-1, B-2, and classified platforms.